Yale hoisting devices are well known and respected throughout many industries and the excellent range of Yale manual chain hoists covers the majority of manual lifting applications. 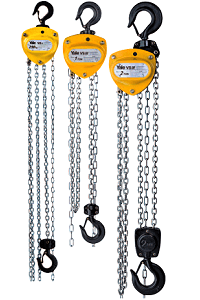 The range includes corrosion resistant models and Atex rated Yale chain block models for those more extreme environments as well as Yale chain hoist models for extra heavy lifting with capacities up to a whopping 20000kg, that’s 2 tonne, quite a substantial weight to lift for a manually operated hoist. 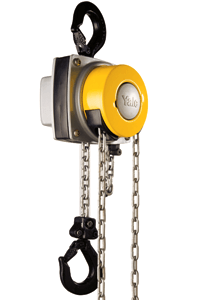 The innovative 360 Yale hand chain hoist enables operation from most positions due to the hand chain guide fully rotating. The 306 is also available complete with an integrated trolley system for added convenience. One of the older models the Yale VSlll has been recently re-developed with numerous improvements and comes with lifting capacities ranging from 250kg up to 5000kg. Lifting Hoists Direct is a major distributor of Yale Chain Hoist models & other Chain Blocks and is able to offer the complete UK model range at some of the lowest prices around, and because we offer a complete range hoist services you can get everything you need in one place. Servicing, maintenance, repairs, spares, inspections and installations are no problem; look after your hoist and other lifting equipment and it will look after you! All Yale chain block models come with clear labelling stating the rated capacity, load chain grade & dimensions, the year of manufacture and a serial and/or model number; this should never be removed and remain clear to read at all times. Please Note that a Yale hand chain hoist should never be used to lift people!